Our self defense weapons line of products consist of telescopic steel baton and kubotans. 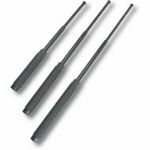 Telescopic steel batons:These batons offer extended reach in a compact size. Telescopic batons are made of solid steel and available in 16 inch, 21 inch and 26 inch. The batons are collapsed until flicked with your wrist to extend them. Kubotans: Kubotans are a very popular martial arts weapon; they are used for stabilizing your wrist, applying pressure to sensitive areas of your assailant's body and for gaining leverage on an assailant's wrist or finger. A kubotan is made of aluminum and available in 4 different colors and in flat or pointed models.